Some recent guests of our sent us this photo from their holiday. "I didn't see that when I took the photo!" We've suspected that a pine marten had moved into the area, in fact we thought that maybe be hole that had been made in our compost heap was his. This morning our suspicions where confirmed, when this fellow was seen coming out of the heap and foraging around the garden. We'd left some scraps out for him and one by one he took them and carried them away into the undergrowth. Strange thing was he was here in the morning, about 9.00. Thought they where mostly nocturnal. This photo's not very good, will keep a look out for him over the next few days and see if we can get some better pictures. 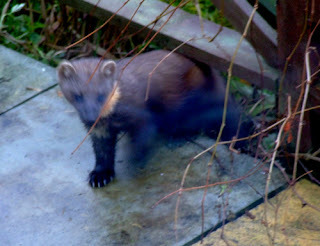 We saw the first Pine Marten ever at Pottery House this evening. We were watching TV when we saw a shadow run past the patio doors. When we looked out the front we saw him rooting through our plant pots. Didn't get a photo, will try next time as we've put out a peanut butter sandwich for him ( a Pine Marten favourite, so we've been told). The mountains on the other side of Loch ness from Dores had snow on them this morning, the first of this winter. Only a light covering, but snow non-the-less.